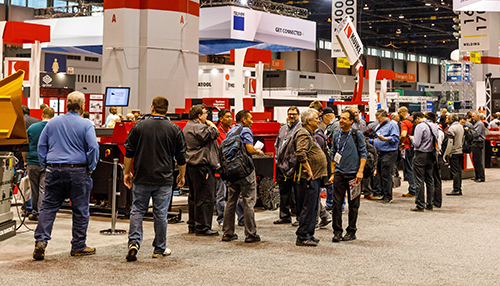 With nearly 45,000 attendees through the doors, FABTECH 2017 delivered. Bringing metalformers and fabricators together under one roof in Chicago last November, the event provided opportunities to see productivity- and quality-improving technology and interact with product and service providers. 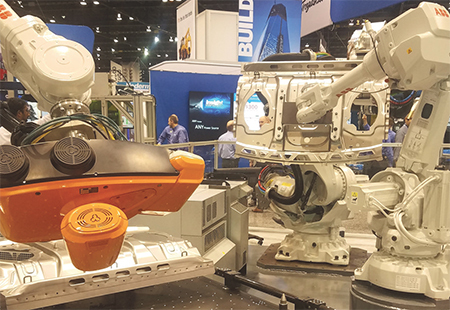 MetalForming editors were all over FABTECH, and here we bring you a sampling of the wide variety of technology that caught our eyes. Look for more in coming issues of MetalForming. MC Machinery tied automated part handling to its quiet model BB4013 electric press brake, featuring an AC servo motor and ballscrew mechanism to deliver high speed and repeatability—to ±0.001 mm. Its ram-shaft drive enables high-speed movement at 100 mm/sec. with high ram repeat-stop accuracy. A 15-in. color Windows-based touchscreen control enables simple, rapid programming. Offline 3D programming is available as well, with all imagery appearing at the control. The company also showcased a part-handling robot tied to the brake to illustrate hands-free operation; and its model SR-F fiber-laser-cutting machine, available in 2- and 3-kW capacities. The entry-level machine offers standard features such as Mitsubishi’s Motion-Cut and Eco-Mode technologies as well as auto focusing. 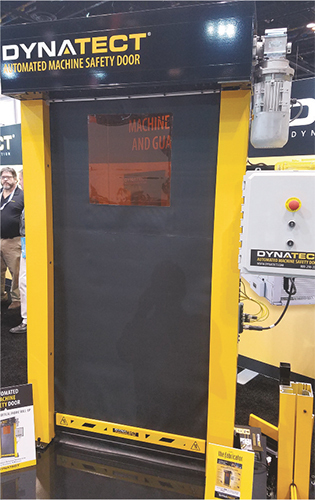 The Gortite VF (vertical-fabric) door from Dynatect Manufacturing, Inc. was designed to safely isolate hazardous operations from other industrial processes, material, equipment and people, while still allowing access. The vinyl roll-up door is installed in conjunction with existing machine-guard panels on each side of the door to further enhance the separation of environments. Typical applications include automated production and machine processes that require preventive measures, such as robotic-welding, processing and transport tasks. The door can help increase the safety of industrial facilities by containing common process-generated hazards such as light debris, fluid splatter/mist, weld smoke, sparks and intense flash. To avoid accidents during daily operations, the door is equipped with a traveling photo-eye sensor that brings the door to a full stop in a matter of seconds. An optional window allows for safe supervision of isolated processes. The red or bronze OSHA-compliant UV window is suitable for welding applications. The new SnapWeld collaborative-robot (cobot) welding package, developed by Arc Specialties Inc. and Universal Robots, is a cobot-assisted, interactive welding system that can be deployed easily and flexibly in existing manual-welding booths, eliminating the need for new robotic cells. 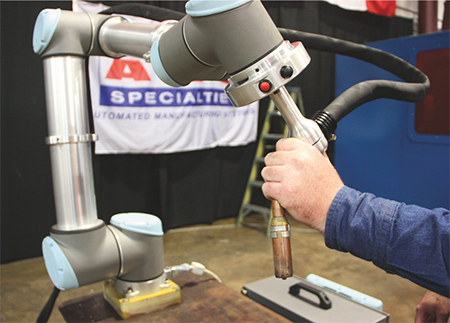 “We are getting a lot of requests for integrating Universal Robots in welding booths, so we saw this as a unique opportunity to develop an integrated low-cost system for gas-metal-arc-welding applications that no one else in the market is currently offering,” says John Martin, vice president of Arc Specialties. SnapWeld debuted at FABTECH to high interest, with attendees able to grab a Universal Robots UR10 robot arm and perform stitch welding by teaching the robot start and stop points, as well as the number and length of the stitch weld. The SnapWeld system moves along the start and stop path and welds only during specified stitch areas, reducing robotic programming from hours to minutes. The welding system integrated with the UR robot is comprised of a Profax wire feeder and water-cooled torch enabling welds to 600 amps, with torch bracket, all cables and hose packages included. The simplified programming is enabled by direct software integration into Universal Robots’ own programming environment through the Universal Robots+ platform, which allows users to program advanced settings directly on the teach pendant that comes with the robot. Settings include features such as wire-feed speed and burn-back time, gas-flow time, and crater-fill time with instant feedback on welding volts and amps. Park Industries debuted its Kano HD CNC plasma-cutting machine, promising bidirectional positional accuracy within ±0.004 in. and repeatability within ±0.001 in. The powerful drive system delivers repositioning at 160-mG acceleration and 1800-in./min. rapid-traverse speed. The 600-in./min. Z-axis lifter speed optimizes productivity using Hypertherm’s Rapid Part Technology. 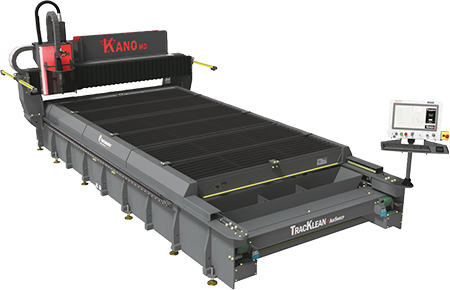 The Kano HD unitized machine base and gantry beam are heavy steel weldments configured with a Hypertherm Edge Connect CNC and a Hypertherm HPRXD or XPR300 high-definition plasma system for production cutting to 2 in. thick. Also included: Park’s TracKlean self-cleaning downdraft air table, with load capacity to 7400 lb. ABB’s signature display combined the flexibility and productivity of robotic manipulation with state-of-the-art inspection technology. The company’s new robotic-inspection system with integrated 3D vision uses digital scans to detect defects on manufactured parts. The digitalization inherent to ABB Ability, a range of the company’s optimization and automation products, monitors the status of all welding-system components, delivering timely and actionable information. The system consists of a 3D white-light scanning sensor mounted to the arm of an ABB robot, relying on the agility of the robot to provide the precise movements necessary for the sensors to access most areas of simple and complex parts from the optimum angle. Sensor technology rapidly records and compares detailed geometric and surface data with digital CAD models, enabling the automated inspection of manufactured parts and pieces. The payoff: Users can reduce cycle times while raising quality and reducing the risk of quality-control errors. 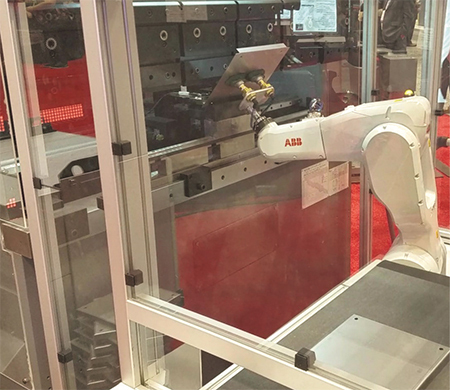 In the FABTECH display, a sensor mounted to the arm of an ABB IRB 4600 robot (a general-purpose model optimized for short cycles) simulated the inspection of a metal component spot-welded by an IRB 6700 Lean ID robot (a medium/heavyweight model featuring an ABB spot-weld gun). 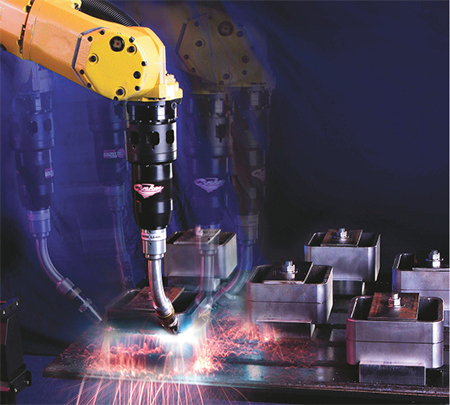 A compact, high-payload-capacity IRB 2600 robot shuttled the part between the inspection and spot-welding robots. 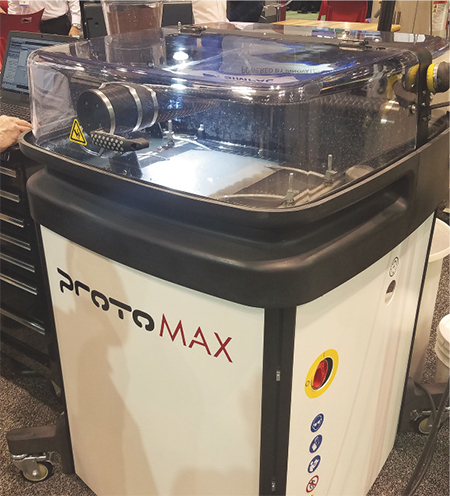 Omax Corp. debuted the unique ProtoMax abrasive-waterjet machine, designed for prototyping, light industry, technical education, artists and the maker movement. Its show-floor demonstration drew a large, inquisitive crowd at FABTECH, especially those looking to cost-effectively explore waterjet-cutting technology as an addition to their fabricating businesses. ProtoMax proves ideal for prototyping and relatively low-volume cutting of almost any material less than 2 in. thick. It brings all the versatility benefits of larger machines in a compact package that can well-serve small job shops, engineering classrooms, makerspaces and personal use, according to Omax officials. It also can be an ideal addition for large shops that need occasional waterjet capabilities to complement other capabilities. Delivering 30,000-psi cutting power with a 5-hp pump, ProtoMax submerges work material in water for clean, quiet cutting that won’t disrupt a shared workspace. 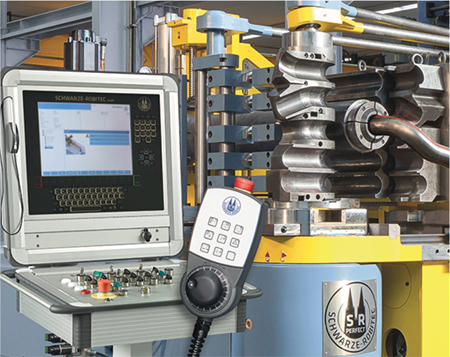 Intelli-Max software controls programming of part files and the cutting operation. In its expansive FABTECH real estate, Lincoln Electric unveiled the Power Wave R450 for high-performance robotic welding. 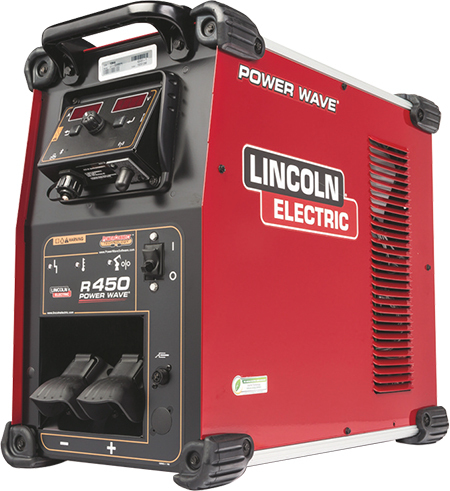 Rated for 450 amps at 100-percent duty cycle, the robotic-welding power source is equipped with Lincoln Electric’s Waveform Control Technology featuring a comprehensive portfolio of welding modes, including gas-metal-arc, gas-tungsten-arc, flux-core and advanced pulse modes specific for nickel, stainless, and low- and high-alloy steel as thin as 0.6 mm. The power source delivers rapid travel speeds, low spatter generation and high gap-bridging capability, and is engineered for automotive, heavy-fabrication and general-fabrication environments. The Power Wave R450 features the ArcLink robotic-communications interface, which provides plug-and-play capability with leading robot manufacturers. It also provides Wi-Fi and Bluetooth connectivity, allowing welding operations to quickly access and track essential welding data with Lincoln Electric’s CheckPoint production-monitoring software. 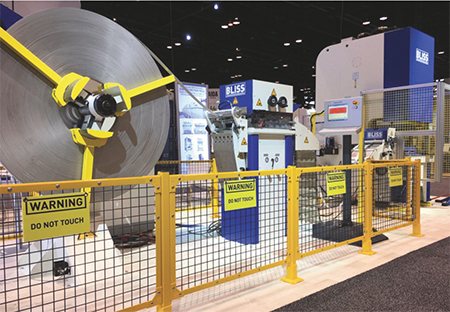 Visitors to the Schuler booth witnessed the new 125-metric-ton Bliss stamping press equipped with a new Bliss coil-feed system. Up and running on the show floor, the C1-125 single-point gap-frame mechanical press features Allen-Bradley controls, a fast-acting hydraulic-overload system, Ross valves, Siemens drive motor, Graco lubrication, an OMPI clutch and flywheel brake. The standard configuration attains 30 to 60 strokes/min; the model B300 compact coil-feed system feeds stock to 300 mm wide. Kuka‘s new ready2_use preconfigured welding packages drew the attention of FABTECH attendees. The solutions, which can be integrated into existing production environments, include the ready2_arc package that combines Kuka KR Cybertech nano and KR Cybertech arc nano robots with Miller Auto-Continuum 350 and 500 power supplies. This package is for typical welding tasks—thin to thick sheet carbon steel, aluminum or special welding modes for root-pass, narrow-gap or deep-penetration welding seams. 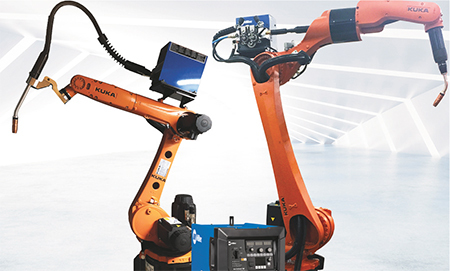 The Kuka ready2_spot uses servo guns for the quick and easy implementation of spot-welding applications when joining steel and aluminum parts. The TruMatic 1000 Fiber, Trumpf’s first entry-level punch-laser combination machine with a solid-state laser, attracted expo attendees due to its modular design that enables users to add to it as business grows. The patented Delta Drive moves the electric punching head and the laser along the Y-axis while the sheet moves in the other direction. This reportedly increases machine dynamics, productivity and process stability, contributes to a significantly compact footprint, and enables material handling options such as the SheetMaster Compact. The machine’s integrated protective housing automatically moves out of the way during punching operations for maximum visibility and accessibility. Decreasing relative movement between the machine table and the sheet also reduces the risk of collisions and makes the process more reliable overall. The machine will automatically sort finished parts to 7 by 7 in.—processed parts move down a chute for sorting into a series of four boxes positioned below the machine for easy removal. Alternatively, an additional extra-large flexible parts flap provides users with a second choice for part sorting. Equipped with a sensor that detects whether all parts have been properly ejected from the machine’s working area, this solution can be used to eject long and wide parts into containers as well as onto conveyors or pallets during punching and laser operations. Six months after new owner Right Lane Industries LLC acquired Pacific Press Technologies, the company used FABTECH to launch its Blaise family of servo-hydraulic press brakes. A working 175-ton model, with a 12-ft. ram, produced mobile-phone/business-card holders to showcase some of its bending capabilities for visitors. The Blaise family offers capacities of 175, 250 and 350 tons with maximum bending lengths of 10, 12 and 14 ft. These press brakes feature industry-standard Delam CNC controllers. To maximize machine uptime, the company integrated components with a proven history of high mean-time between failure from its larger press brakes into the Blaise line. And, as the company’s founders leveraged their knowledge in developing hydraulic technologies for U.S. Navy jets to construct metal-shaping systems, the Blaise line was created to enable the user to experience a fighter-jet-cockpit operation. This is accomplished by attaching the controller to a pendent arm, where the user interface comes to the operator. Through the interface, drawings can be uploaded via a shop’s network, resulting in job-changeover efficiencies, especially for smaller batch runs. To accomplish minimized ram deflection and its contribution to variances, hydraulic cylinders are trunnion-mounted, resulting in a lesser degree of freedom. Also, this mounting design moves the cylinders toward the center of the ram, which increases bend reproducibility. 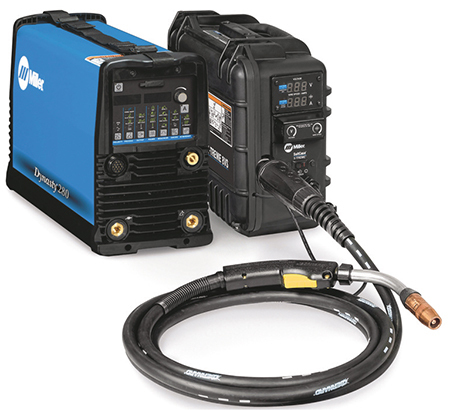 Miller Electric introduced its Dynasty 280 DX with CV, a multiprocess power supply capable of AC/DC gas-tungsten, gas-metal and shielded-metal-arc welding. The 280-amp portable (55 lb.) machine is suitable for shop or jobsite applications, including precision and heavy fabrication, and pipe and tube fabrication. Its Blue Lightning high-frequency (HF) arc-starter technology provides noncontact arc initiation, reportedly resulting in more consistent arc starts and greater reliability compared to traditional HF arc starters. 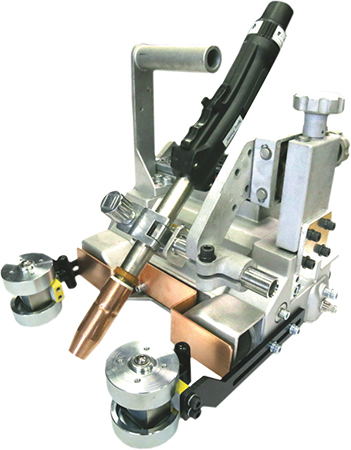 The machine also includes Pro-Set technology, which eliminates the guesswork when setting weld parameters. Operators can simply select the feature and adjust until Pro-Set appears in the display. 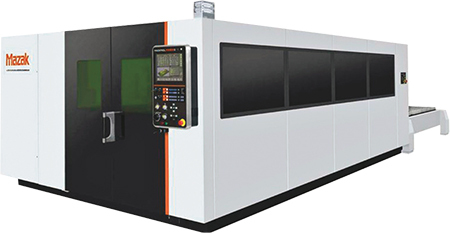 Mazak Optonics Corp. showed its new Optiplex 4020 Fiber III 8k-W laser-cutting machine at FABTECH, utilizing a new PreviewG control and higher-performance digital drive package. The drive system optimizes productivity through high speed and high accuracy, and the PreviewG Control offers a state-of-the-art CPU and a large 19-in. LCD touchscreen. Designed to integrate intelligent setup and monitoring functions, the cutting machine delivers features that simplify operation and reduce operator dependency. A two-pallet changer design with a helical rack-and-pinion positioning system delivers high throughput; sensors in the multifunction cutting head monitor piercing and cutting operations to improve throughput and part quality. Koike Aronson’s Wel-Handy Multi II, introduced at FABTECH, is a compact welding carriage used to perform a variety of semiautomated processes such as stitch and fillet welds, as well as overhead and vertical welds. At 16 lb., the compact tractor unit can be moved easily to remote locations. 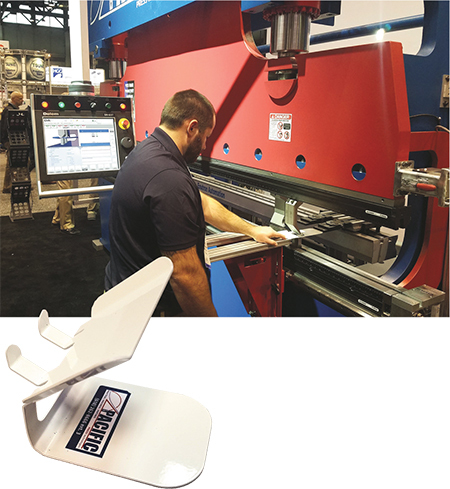 A company spokesperson at the show emphasized that one of the major innovations of the Wel Handy Multi II is its ability to perform a backstitch weld to create a crater cap, thus ensuring uniform welds from start to finish. Further, analog dials combined with the precision of digital controls ensures ease of use and repeatable, consistent welds for any operator with basic welding knowledge. ESAB Welding and Cutting Products debuted Purus 42, a solid wire available in diameters from 0.030 to 0.062 in. The wire can reduce post-weld cleaning time and unplanned downtime associated with spatter, reduce or eliminate downtime for removing silica islands in multi-pass welding, and reduce or eliminate paint-related quality issues. New metallurgy enables Purus, classified as an AWS ER70S-6 EN/ISO G3Si1 wire, to reduce formation of silica islands so that slag self-releases or easily brushes off. The wire is available as a bare wire or with a copper coating. Purus reportedly is ideal for high-volume semiautomatic and robotic applications, with Esab officials noting that one manufacturer of construction equipment reduced arc-ignition errors by 66 percent in multipass applications when using the wire. Previously, according to a company official, excess silica islands prevented positive arc ignition, and when this occurred, the manufacturer needed to shut down the robotic-welding station, spending an average of 3 min. to clean the silica islands. Given the station’s hourly rate of $280, each stop cost $14. Purus meets all the technical requirements for an S-6 wire, enabling users to change wires without requalification, and offers batch-to-batch consistency due to tight control of element ingredients. The wire also provides good wetting so that the weld puddle flows well and with a smooth transition at the weld toe. And, by creating a good bead profile and surface appearance, it can reduce or eliminate the need for gas-tungsten-arc dressing or grinding to remove stress concentrations. Bystronic introduced a mobile automation module for its Xpert 40 press brake. The result is a compact solution for automated as well as manual bending. Users can process large lots with the automated bending cell, and also bend small lots or individual parts manually when necessary. Just plug in and start bending. Setup of the robotic system takes just a few minutes. 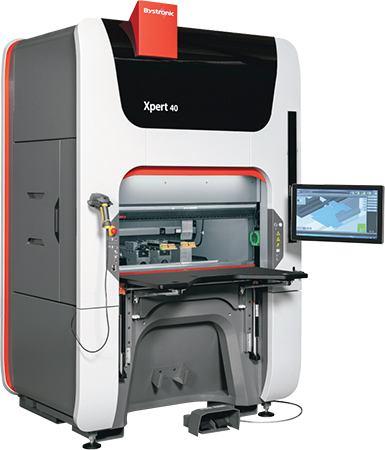 Also introduced at FABTECH were two new options for the Xpert 40 (shown): a bending-line laser, which enables part bending without using the backgauge, ideal for conical parts and others that do not provide a stop position; and an optical footswitch control to optimize versatility and ergonomics. 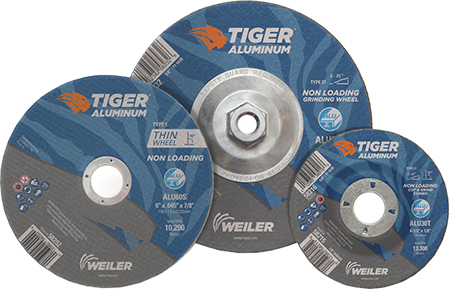 Weiler Abrasives Group introduced the newest addition to its lineup of Tiger aluminum cutting, grinding and combo wheels. The new offering features a nonloading formula that keeps the wheels from gumming up, allowing operators to get more work done in less time. Further, their extended wheel life reduces changeovers and lowers cost-of-use to improve productivity and the bottom line. The new wheels complement the company’s Tiger Aluminum resin fiber discs, Tiger Ceramic Saber Tooth flap discs, nonwoven products and power brushes. Abicor Binzel debuted its Abirob Cyclone for air-cooled robotic-welding applications. The offering enables optimal current transfer to the torch without loss of amperage to meet the demands of high-production operations, while its torch neck rotates endlessly in a full 360-deg. rotation. The modular design enables easy assembly/disassembly and maintenance. In addition, the company stresses that the Cyclone technology, when used with robotic-welding cells, will result in less wasted motion, higher production and reduced part cost. Schwarze-Robitec, with new office and warehouse facilities in Grand Rapids, MI, showcased its range of tube- and pipe-bending machines as well as fully automatic bending cells. The booth featured a state-of-the-art CNC 100 E TB MR tube-bending machine in action. The machine allows for production of different radii or bend-in-bend systems, such as manifolds and exhaust pipes, and the company’s full-electric and multi-stack CNC tube-bending machines allow for a range of different tube and profile dimensions to be bent. Users benefit from short cycle times, high speeds and high accuracy, according to company officials. In combination with individually adjustable tools, multi-level technology reportedly enables problem-free and accurate shaping of tubes even with short lengths between individual bends. The CNC 100 E TB MR can be used to bend exhaust pipes with a bending radius of only one times the pipe diameter. Its integrated rapid-clamping system, Quick Tool Unlock, allows rapid changing of bending tools. This helps optimize setup time and reduces machine downtime. V.good knowledge of latest technologies adopted,which really powered to automotive industry .! !